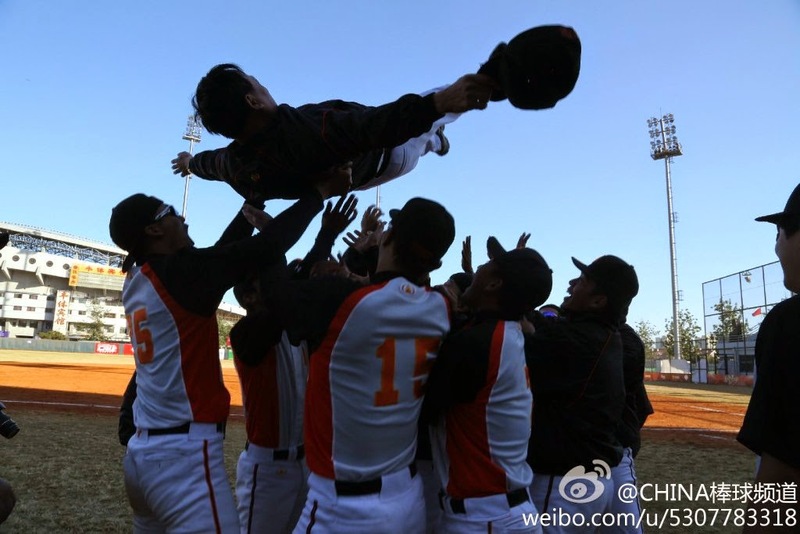 Chinese Baseball: The Beijing Tigers Win The 2014 CBL Championship Series! The Beijing Tigers Win The 2014 CBL Championship Series! Congratulations to the Beijing Tigers for winning the 2014 CBL championship series. They beat the Tianjin Lions 2 games to 1 to become the first champion after the league's restart. According to CBL's weibo, Tiger's pitcher Yang Hai Fan pitched a hell of a game against the Lions. The Lions had many scoring opportunities, but failed to close the door on the Tigers. It was veteran Wang Wei who knocked in the winning run for the Tigers in extra innings. Again, they don't have any official box score for the game yet. It will probably be posted a few days after the championship game. The Lions came back with a satisfying victory against the Tigers as veteran pitcher Su Changlong lead the team with a shutout. I guess it was the uniforms the day before that made the Lions lose. Here's the summary of what happened. It has pictures! The Tigers took an early lead of 2 to 0, but the Lions answered back in the 7th with one run. The Lions had the based loaded in the 8th, but didn't score. The Tigers then answered back with a run on the bottom of the 8th. The Lions scored again in the 9th by an error, but the Tigers hold on for the championship. Kind of like the World Series, Yang Hai Fan came in and shut things down like Madison Bumgarner! I think the season was okay considering all the delays it had earlier in the season. The estimated attendance for the 12 games were 4,690, averaging 40-1000 people per game (got the numbers from the box scores). Again, most people don't understand the rules and think it's boring, so it'll take some hard work and time to get more interest! Speaking of coverage, it's hard to find any kind of media that can actually cover baseball in China. A lot of people from Baidu doesn't actually know if the game was broadcast live or not( I don't know myself). Many fans relied on the microblogging coverage from weibo or live feed from Baidu's baseball forum. Also, the way people write about baseball is different from how they write it in the States. My guess is that the league is short, and individual statistics aren't as emphasized as it is here. It's a team game after all, right?! Oh yeah, and no video clips! The uniforms were way better than the ones they used back then. Style matters! Anyway, I really hope the CBL launches an official website next year. Things would be a lot easier for people like me to read if they didn't use a microblogging platform. There are a lot of things to improve, but can't really complain. It's been fun following the league! What's left in baseball to follow? There's still the KBO championship going on and the upcoming Japan vs. MLB All-star series. Thanks for reading and have a great day! Don't worry, I'll keep updating! Baseball is around everyday no matter what! It's part of our lives! As expected, Yang Hai Fan was voted as the MVP and the best pitcher of CBL. You can read all about it here, which also gives the ranking for each teams.